Paint the Town, Striped Pear Studios� debut collection, was inspired by Reykjavik, Iceland, where the designer lived for several years with her husband and adopted Icelandic cat, Eyja. The houses and rooftops in the charming city were painted in many different colors which lifted her spirits in the dreary wind and rain. 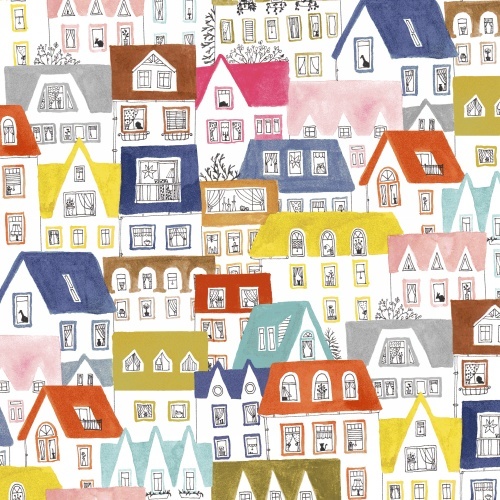 She hopes that people find inspiration in the colorful and whimsical patterns. Surround yourself with these fun patterns and colors for a daily reminder to focus on the little nuggets of joy all around you. Printed on 100% GOTS cotton. 17 Skus. On sale October 2017. Delivery to stores April 2018.